Star Wars: Celebration: LEGO Set Exclusive! Today has been a day us Star Wars fans will never forget! With the new The Force Awakens trailer unveiled to the world, exhibits from the movie, and many other awesome amazing surprises shown off in all their glory! As a huge LEGO Star Wars fan I’ve been patiently waiting for news on any exclusive reveals they had in store, and guess what? My patience has paid off! LEGO unveiled today its Celebration exclusive: a very different set from what we’ve seen before, but a set that could well be the beginning of another fun Star Wars LEGO line! On Wednesday the LEGO group unveiled its first Star Wars Celebration exclusive, four brand-new buildable figures to be released in September. Today’s reveal is completely different in size and style, a first-of-its-kind mini-LEGO set that replicates the Lars homestead scene from A New Hope! The set comes with the Lars homestead, Luke, droids (C-3PO & R2-D2), Jawas, sandcrawler, a mini landspeeder and, last but not least, a C-3PO minifigure! 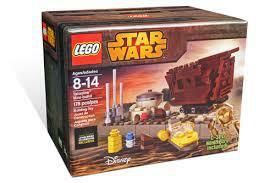 This set will be available at retail for $40.00 and contains 178 pieces. A fun-looking set right? I’ll definitely be picking this baby up, what about you? Check back tomorrow for more Star Wars Celebration news as it hits!